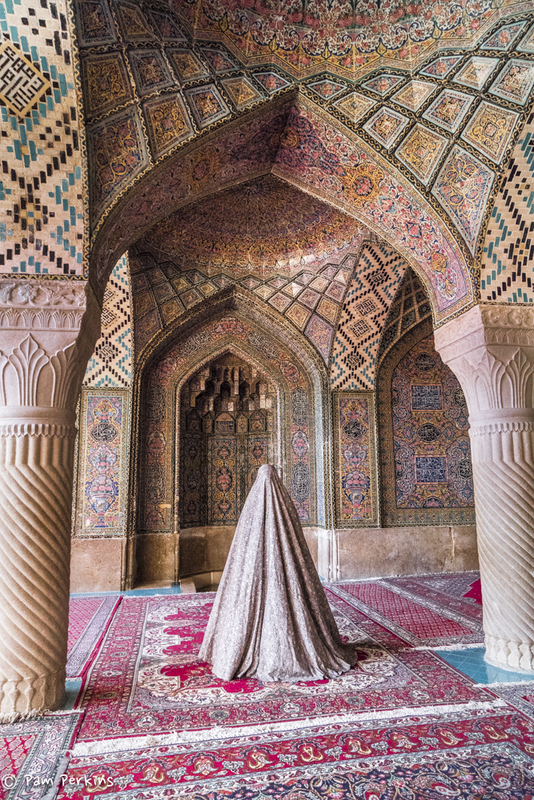 Pam Perkins | HOW DO I TELL MY FRIENDS ABOUT MY AMAZING TRIP TO IRAN? There is nothing like traveling to another country to expand one’s preconceived notions and find that those notions had more to do with ignorance than fact. This is what happened to me when I traveled to Iran in October. Prior to my departure, people asked whether I was making the right decision, suggesting I might want to think twice about visiting a country that hates America, urging me to watch my back, hoping I might change my mind, and praying I make it home safely. 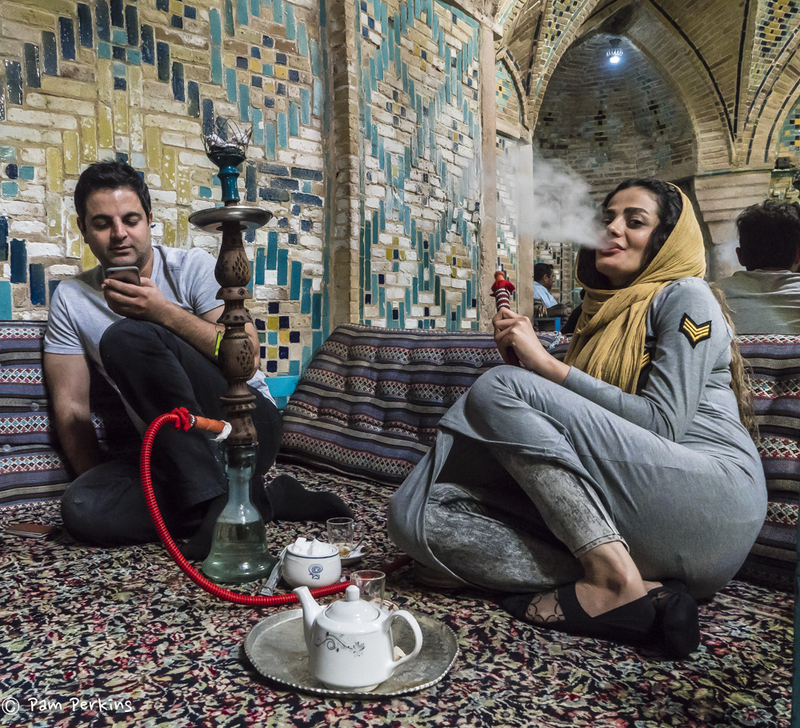 None of these people have traveled to Iran, and they probably never will because preconceived notions have a way of preventing people from stepping out of their comfort zone and separating fact from fiction. During my visit to Iran I wondered how best to describe this trip because there was so much to tell. 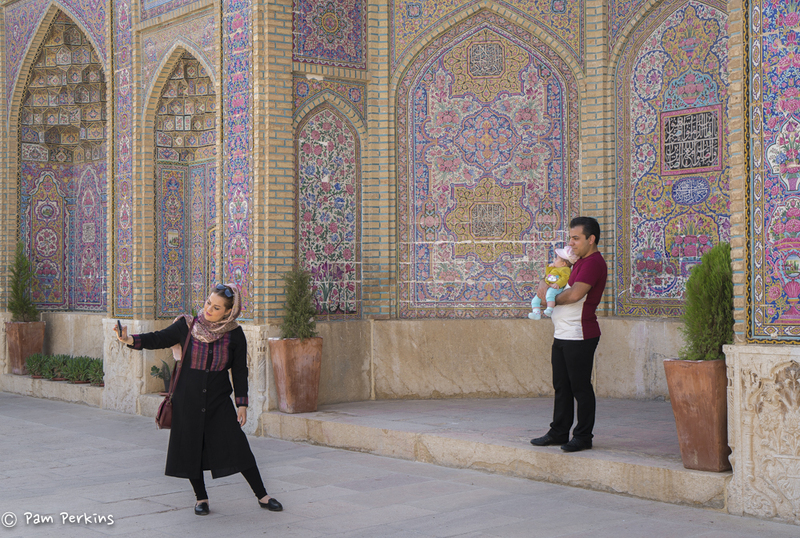 First, I could provide our 19-day itinerary and explain colorful details about each spectacular city we visited: Tabriz, Zanjan, Yazd, Tehran, Shiraz, Firuzabad, Yasuj, and Isfahan, but my written piece would be way too long. I could also share a few poignant stories to illustrate how warm and welcoming the Iranian people were — how they would stop you on the street and ask where you were from. And when they heard we were from America, they smiled, gave us a thumbs up sign, a vigorous handshake, and sometimes even a hug. Their genuine greetings were warm and inviting, not pushy or aggressive. And these were some of the words we often heard. We love America. We love Americans. Many Americans lived here before the Revolution. Some of our relatives now live in America. I have an aunt in Sacramento. President Obama was good. The new guy not so much. Politics in both countries bad. Would you like to come to my house for dinner? My mother will make Persian food. If you need help, here is my phone number. Call me. We were like movie stars in Iran. It’s true. I can’t tell you how many selfies were taken of me with a group of giggling teenage girls or with a family who coaxed me to sit down on their blanket and enjoy their picnic. In Iran I was proud to say I was American, when on other trips years ago, I wanted to pass myself off as Canadian. We had some long bus rides, and while I wasn’t excited about the eight hour roundtrip drive to see one of the oldest Armenian churches in the world, it was an impressive sight, and during our time on the road, we enjoyed the comforts of a mini-bus, where the six of us each had our own window to see the huge swath of land we covered and the spectacular scenery. 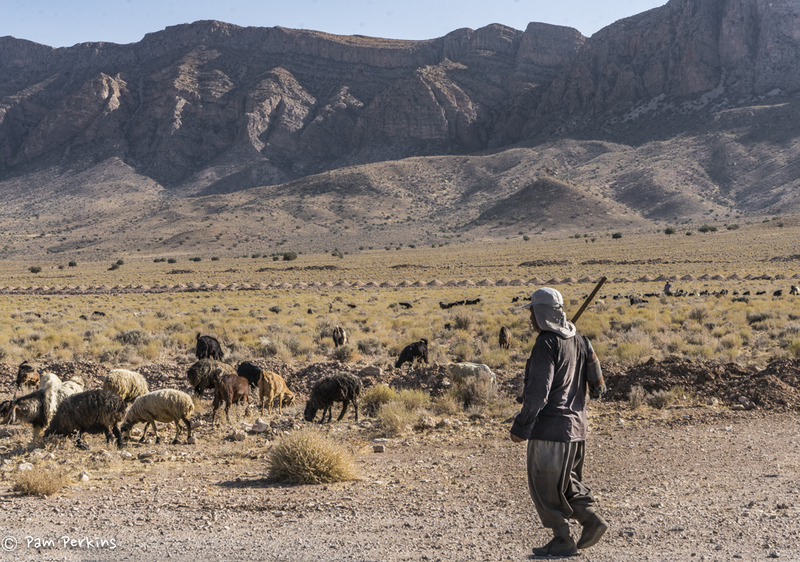 Most people think Iran is one giant desert, but there’s so much more, like steep, rocky limestone mountain ranges, deep gorges, tall waterfalls, and the desert-like terrain is often dotted with scrub brush, fig trees, occasional wild camels, and many herds of goats. The small towns we passed through reminded me of places I’ve traveled before, where old men congregate on park benches to kibbitz with one another, or sit at outdoor cafes drinking coffee and smoking cigarettes, while the women, in this case fully cloaked in black chadors, hustled in and out of nearby shops, busily filling their plastic bags with whatever their family needed for the day. While driving on a busy highway, we gasped when we watched a shepherd lead his herd of goats across a multi-lane divided highway with big trucks and tourist buses speeding in both directions. With grazing spots near the highway, shepherds are skilled at moving their herd of goats in and out of traffic. 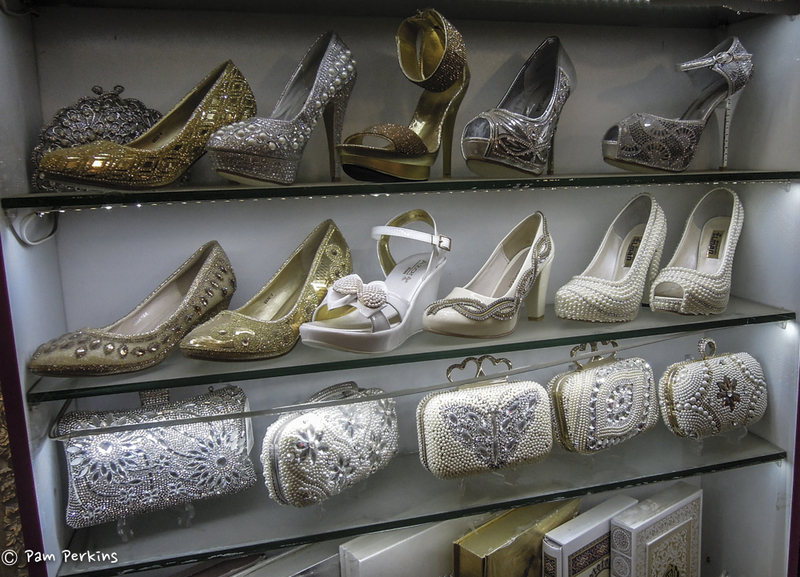 Each city we visited had a unique flavor, but we could always expect a highly decorated mosque or two, a specialty museum and a bustling bazaar that sold everything from hand-woven goods, a variety of cooking utensils to expensive gold jewelry and fancy high heel shoes. 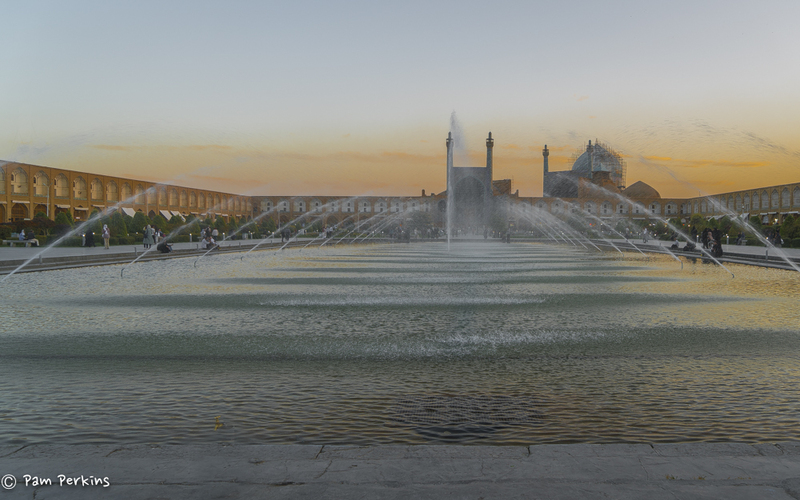 In beautiful Isfahan, the 17th century capital of the Safavids, we saw three famous bridges that spanned dry rivers, but what impressed us most was one of the world’s grandest squares with a highly decorated palace at one end and a colorful Friday mosque at the other. 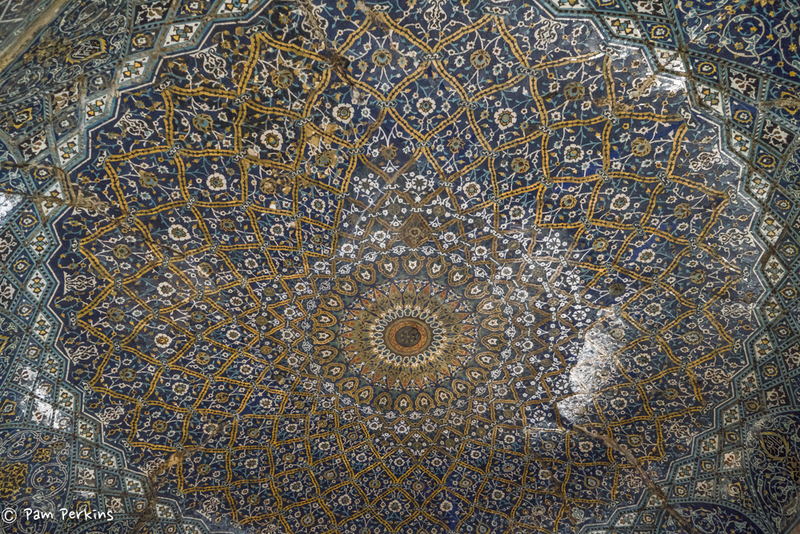 We were tempted to buy art when one of Iran’s most gifted artist showed us how he used a very fine brush to create delicate miniature paintings on camel bone, but a successful Persian carpet shopping spree had us thinking twice. 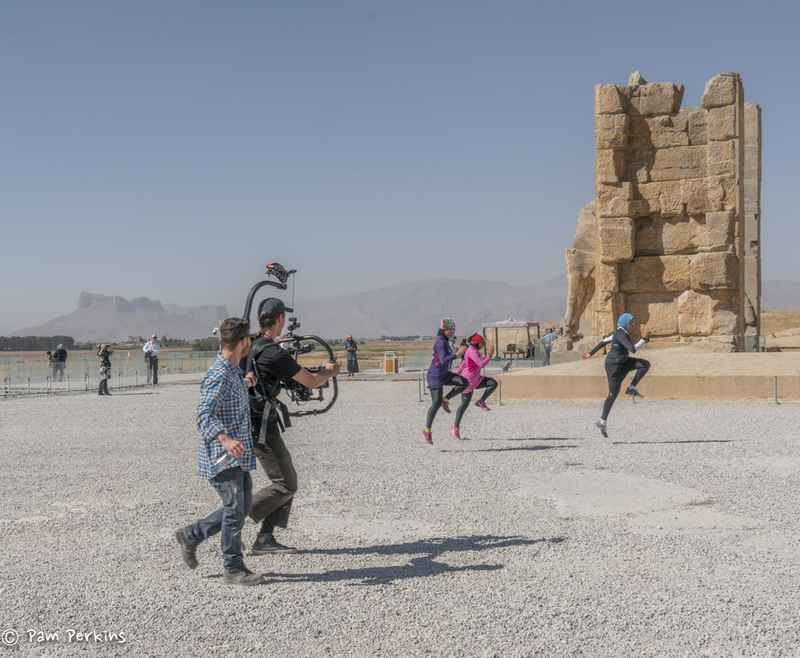 We were entertained at the ancient site of Persepolis when we met a team of international filmmakers (including two Americans) who were making a documentary about Olympic female skiers from Iran, a film to be released on a new Olympic TV channel next winter. 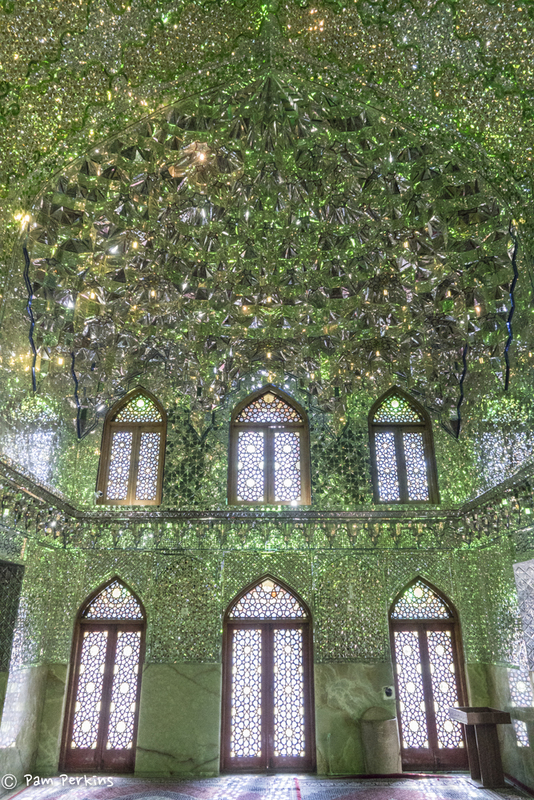 The architectural designs, brilliant colored tiles, and the use of thousands of shimmering mirrors in palaces and mosques can only be described by showing you pictures. 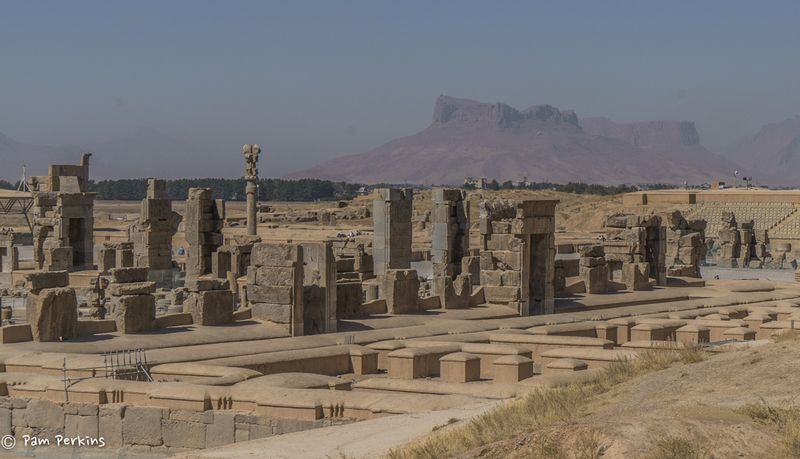 Most people have heard about Persepolis, but when you walk the ancient site, your imagination comes into play as you try and feel what it was like to live in the ancient world. 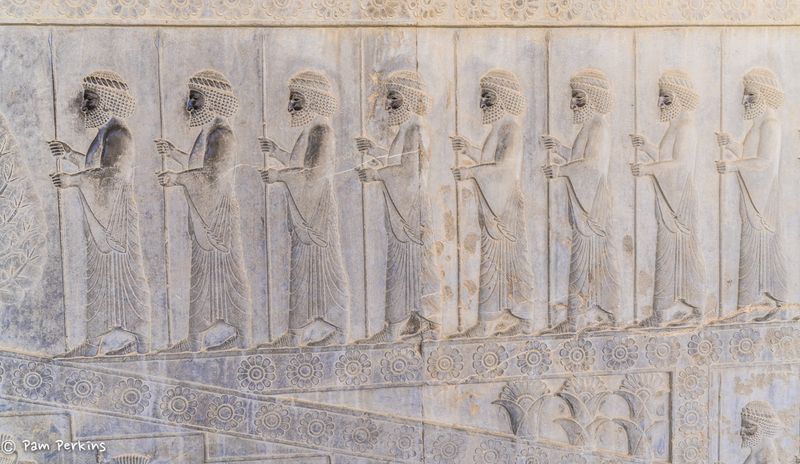 In 500 BC Persepolis was the ceremonial capital of the Achaemenid kings with remains of the palaces of Darius the Great, Xerxes and Attaxerxes. 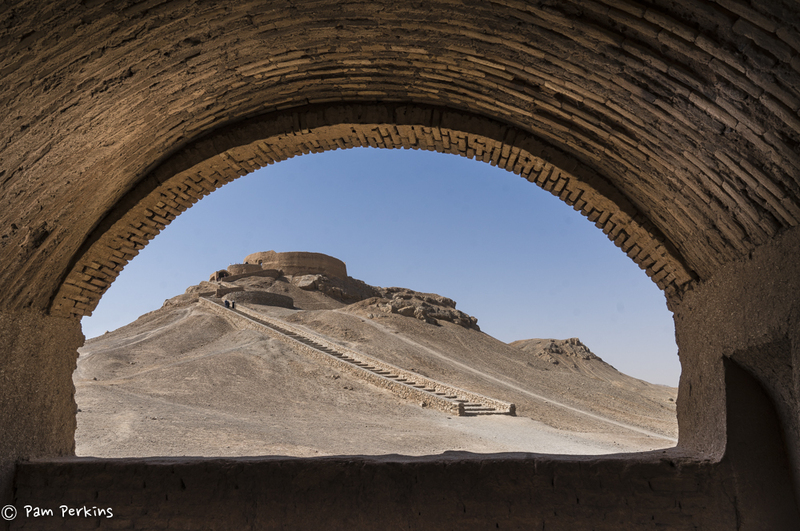 My photograph below depicts only a small corner of the enormous site and the age-worn bas-reliefs of gift-bearing kings representing tributary nations of the Persian Empire. 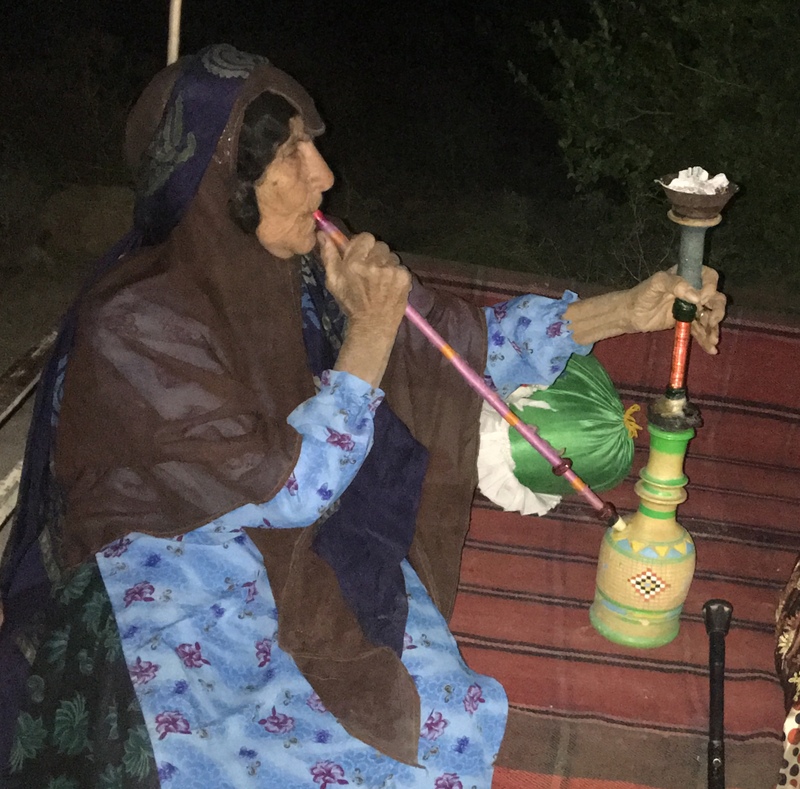 Because of my interest in interacting with nomads, I was ecstatic to visit three winter camps of the Qashgai tribe outside of Firuzabad. The Qashgai is a conglomeration of clans in Iran, consisting of mostly Turkic peoples, but also Lurs, Kurds, and Arabs, and almost all of them speak a Turkic dialect that they call Turki, as well as Persian in formal use. Their main activity is raising livestock, and since they live in a harsh, unproductive land, they travel a distance to nearby villages to buy fruits and vegetables and other goods to support their existence. 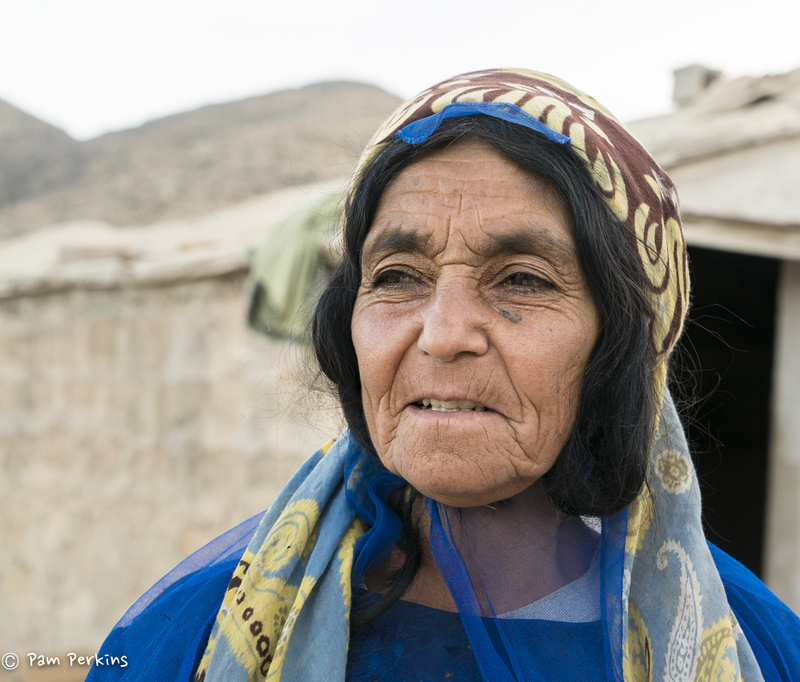 Their water is trucked in once or twice a month to support them, as well as their livestock. The Qashgai women are known for their very colorful dress, unlike the women we saw in the cities, but the next generation of Qashgai want a better life, so like in most nomadic cultures around the world, the young people are moving to the cities and attending university and looking for good jobs . That’s one of the reasons I was so intent on visiting them because like so many tribal cultures on our planet, they will soon disappear. But finding them was not so easy because their camps were scattered throughout a vast mountainous region with rocky steep paths substituting as roads. Even our local guide, who thought he knew their location, had difficulty finding them, as he had to stop several times and ask for directions. When at the Qashgai camps, we were always offered tea, and on one occasion we enjoyed bowls of a corn-based soup and freshly grilled bread. 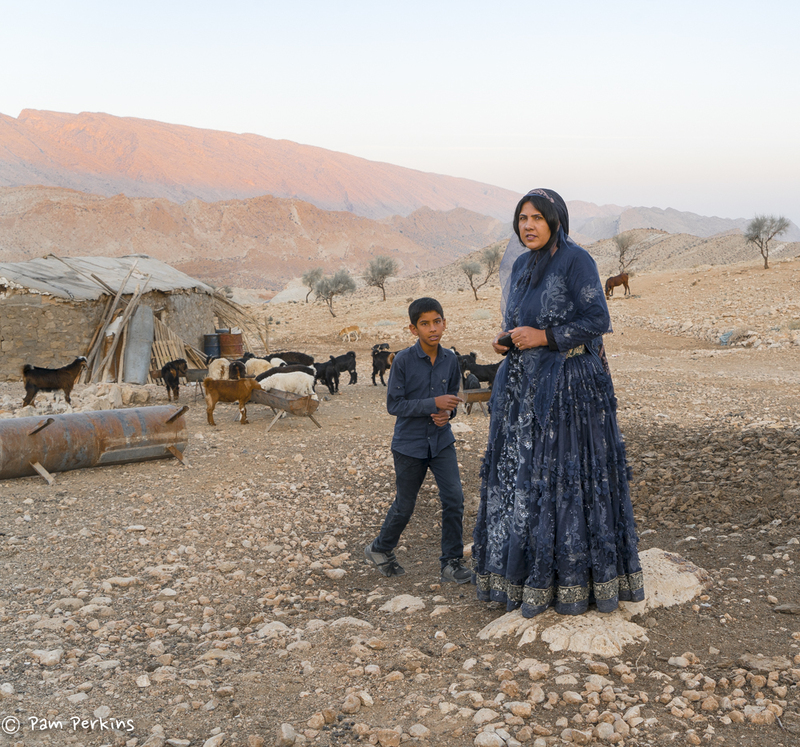 On another day we visited a third camp and drank tea inside the small hut of one Qashgai family, who had four children and more than 200 goats. We sat on their hand-woven carpets inside a one-room hut that served as the family’s bedroom, living room and dining room. Their kitchen was an open fire just outside the hut. 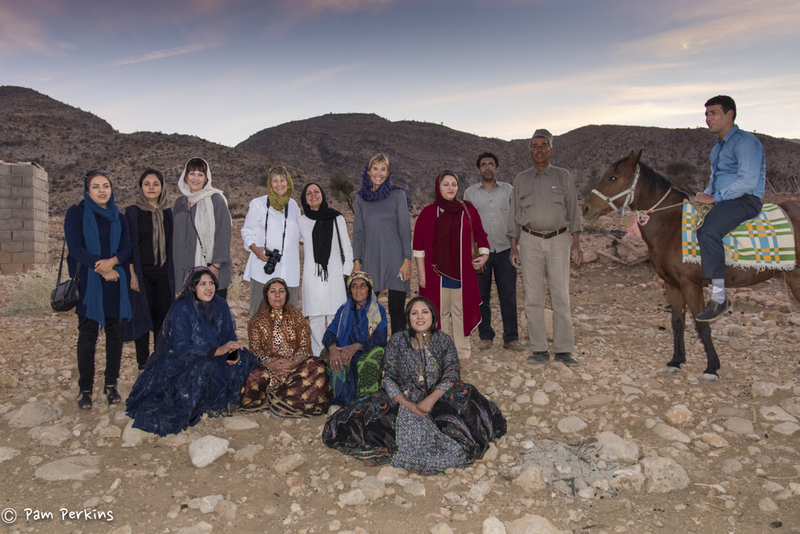 With our guide as the translator, we asked questions about their nomadic life, which, among other things, consists of moving their goats by truck to graze in the high mountains during the summer and the lowlands during the winter months. I certainly never saw anything green for the goats to graze on. Life is anything but simple, but they seemed happy and certainly interested in meeting us since very few tourists go there. After we finished our tea and our questions were answered, they offered to kill a goat and make us lunch, but that’s when we knew it was time to leave. Persian food is healthy and delicious — meat and rice spiced with saffron, barberry, and turmeric and accented with pomegranate, plums, walnuts, tamarind, lemon, heaps of mint and multiple blended spices. Their delicious soups, made with barley, mushroom or corn, were a meal-time staple. The whole milk yoghurt served regularly made returning home and eating non-fat very boring. I filled a soup bowl at almost every meal because the yoghurt was perfect for dipping Persian bread. 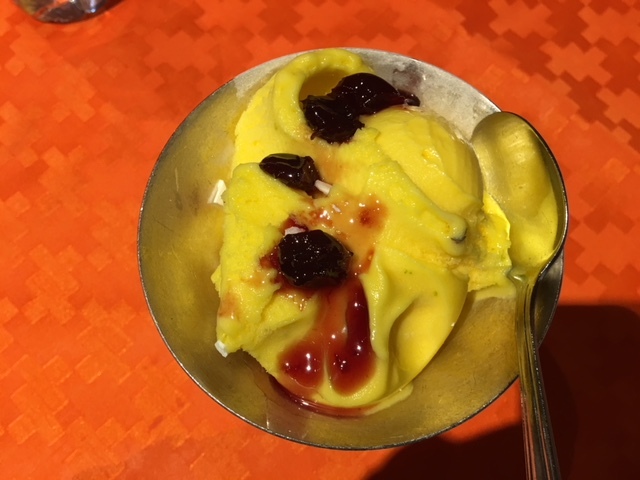 And saffron ice cream. Wow! Bright yellow and delicious. Given my enthusiasm for the food, I was surprised I lost some weight, but then alcohol is forbidden there. It is widely known that a thousand or more years ago, Persian scientists and philosophers were the creative minds of the age, having learned from scholars of Egypt, Greece, Babylon, India and China. Largely by way of Moorish Spain, they enriched the foundation of early Western thought, and left a major footprint on important works involving language, poetry, mathematics, logic, psychology, physics, medicine, agriculture, musical theory, botany, and more. Their legacy includes the world’s first postal service, the first modern astronomical observatory, the first calculator, the decimal fraction, the algorithm and on and on. 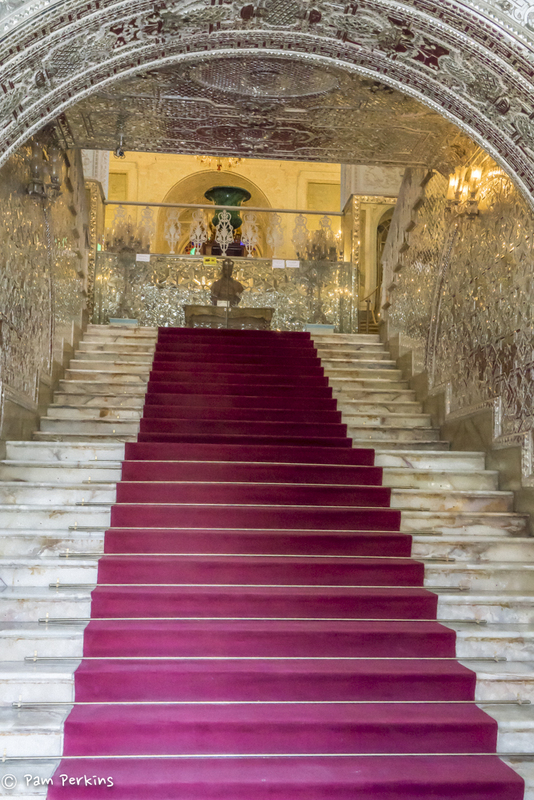 I learned that the Persians inspired the world’s finest carpets (we bought two), miniature paintings (we abstained), ceramic glazes (we were tempted), the Arab horse, the Shiraz grape (now used for juice), the carrot (huh? ), the domesticated rose (via the Ottomans), the paisley motif, the earliest stained glass, and aptly named, the Persian cat. Their ancient poets still popular today– Rumi, Hafez and Omar Khayyam — influenced the works of Dante, Chaucer, Shakespeare, Shelley, C.S. Lewis, and Doris Lessing. I could make the list longer, but you get the point. All of the above boils down to art, history and culture. And yet, at the now abandoned Towers of Silence, dating back to the 18th Century, corpses were left on the platform to be picked clean by vultures, a process which only took a few hours, but that grisly practice no longer exists. Persian history going back some four thousand years ago boggles one’s mind. During our trip, we saw few police, but they were around, just not obvious to us. Yes, as a group we talked about Iranian politics and the Middle East generally, but we shared our comments and opinions in the privacy of the bus. I drank water out of the tap, and ate lettuce and tomatoes, and yet I never got sick. Although I panicked initially, I returned to my hotel room from a day’s outing to find my money belt containing $1000 right where I left it, in the same very accessible place. While gun violence is extreme in the U.S. this problem does not exist in Iran because no one is allowed to have a gun, except for hunting, and these permits are extremely difficult to get. However, many of the locals with whom we talked expressed frustration with their government, just like many of us currently feel about ours. Bottom line: I always felt safe. I always felt welcomed. Yes, as in other countries, there are human rights issues in Iran, gender inequality, and religious codes that push our hot buttons, but I can’t change any of these constrictions, and given the purpose of my trip, I prefer to write about the people and the culture, not the politics. In traveling to Iran my intention was to represent America to the local people I met, but since my return home, I find I’m serving more as an ambassador for Iran to the American people. Most Americans will remain skeptics until they visit there. What confuses some Americans is that Iranians are not Arabs. They are Persians, but they are also Muslims, Shia Muslims. They do not speak Arabic. They speak Farsi. However, my impression is that the government under President Rohani is slowly easing up on some of the strict codes of conduct and confining dress, but it is still the Islamic Republic of Iran, and I saw more women in black chadors than in any other Muslim country to which I have traveled. 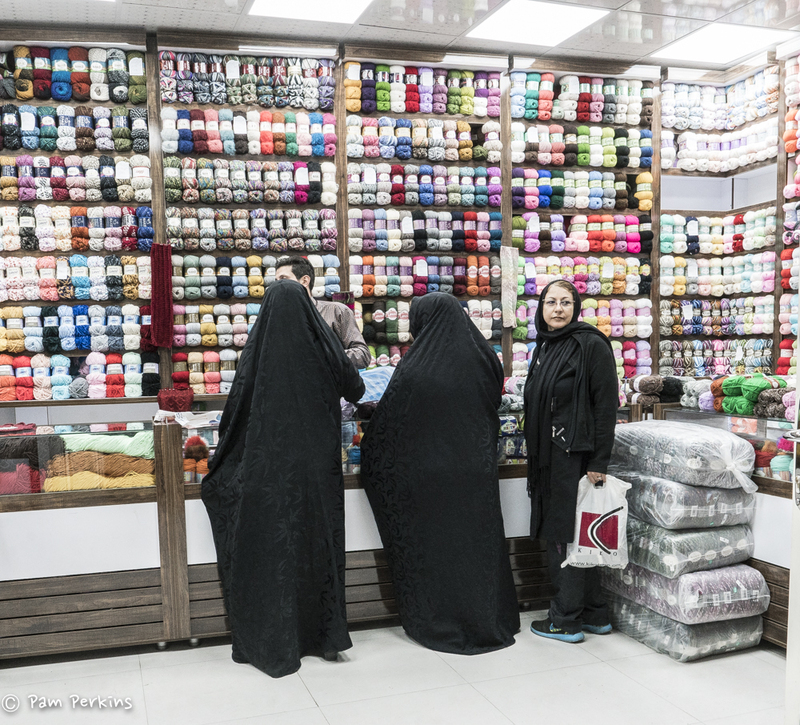 And yet in the big cities like Tehran and Isfahan, I noticed some younger women wearing more revealing clothes, tighter pants and tops, tons of make-up, and a somewhat looser scarf, And yet, sharing the same sidewalk were groups of giggling teenage girls wearing their school uniforms of a black chador with a navy blue head scarf. The teenagers amused me as they pushed each other aside, trying to be first to grab a selfie with us, using their cell phones. In some ways they reminded me of the King Penguins in Antarctica, wearing their black and white uniforms, flapping their wings, and pushing each other aside, squawking loudly, as they sidled up to me as if to say Me first. Get out of the way. Me first. While this trip changed my way of thinking about Iran, it will take some time to process all that I saw and heard during my three weeks of travel. Certainly the people and the culture were appealing, but definitely not the politics or the government and definitely not the head scarf. It’s not easy to understand all the pieces of an extremely complex puzzle in the Middle East, which gets more complicated every day. The question I expect some of you might ask is would I consider traveling there again? My response is an answer I often heard our wonderful guide, Parnian, say: Why Not! Here is our wonderful group. L-R John, Parnian, Connie, Bruce, Pam, Lois, Linda and Rami. Took me back….great write up!!!!! I’m forwarding to some of my friends…..Thanks!!! You know only too well. I’m glad you enjoyed it, Phil. Enjoyed reading about your trip and fascinated with all you saw and your descriptions. Sometimes we just have to see for ourselves rather than be satisfied with what we have been told by others. Thank you for sharing your beautiful photographs and your trip. Enjoyed reading about your trip and was fascinated with your beautiful photographs and detailed descriptions. Thank you. Loved reading your blog and viewing the fotos. Brought back fabulous memories from my trip to Iran in April, 2016. 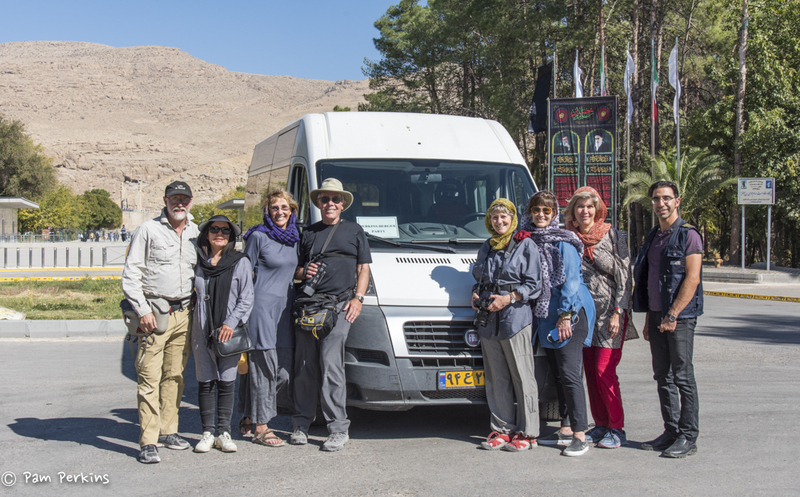 Prior to the trip, I experienced the same questions and worry from family and friends…”why in heavens name would you want to go there?” We were lucky to visit Tehran, Yazd, Tabriz, Isfahan, Shiraz and yes, that interminable drive to the ancient Armenian church. With the exception of your experiences with the Nomads (which I would’ve loved to have done), your words spoke for me, altho more eloquently. Yes, we, also, felt like movie stars with all of our fans following and requests for fotos/selfies. Thanks so much, Pam. One picture is worth, many OMGs. Stunning. I felt I was along with you, for the ride. A reminder that we humans are so various. Easy to forget while in the humdrum of daily humming and drumming. 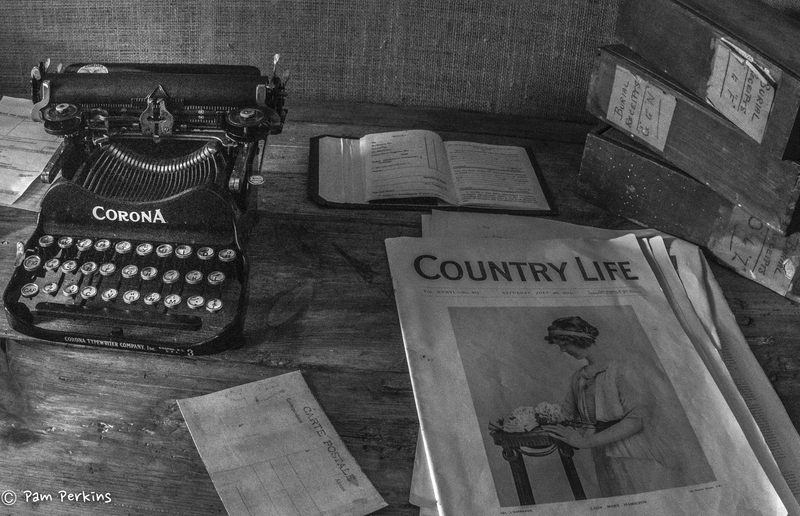 publishing criteria and maybe send this piece in to some newspapers for their travel section. Connie forwarded your article and photos. Wonderful photos, thought-provoking commentary. I hope government can sooner or later get out of the way of their people on both sides of our political division. Very interesting reading! I want to see more photos! I am going to forward this to a friend of mine who came to the US to study and and never went back. He will enjoy hearing how much you loved his country! Hi Wendy, Thank you! So glad you enjoyed it. Yes, you would definitely enjoy going there. Let me know if you want to plan a trip. 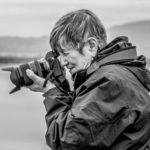 Thank you, Pam, for this enlightening story and photos. WOW! I loved seeing the Moorish influence in southern Spain. 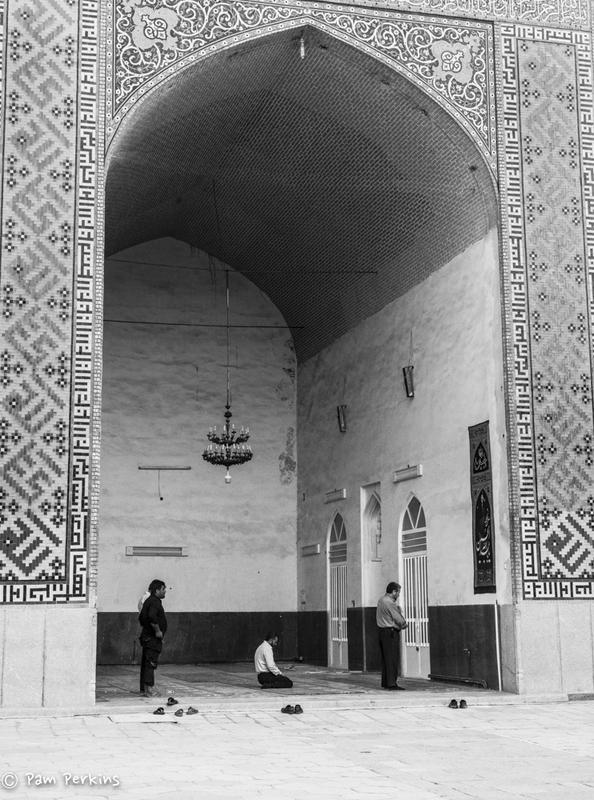 These photos remind me of temples we visited there, only in Iran you have the cultural experience as well. I’m happy you had such an eye opening trip and we all get to armchair travel with you!